Request a demo How can we help you? There’s a growing demand for document sharing and collaboration with stakeholders both inside and outside the enterprise. In recent studies, respondents indicated that over half of their employees needed to share files with stakeholders outside their organisations. From clients and suppliers to regulatory authorities, information must increasingly be shared with a variety of stakeholders to support effective operations and service levels. As a result, businesses must carefully assess their file sharing methods for optimal control, visibility, and security. Cadac Organice TaskForce is changing the way information is managed and shared both inside and outside corporate boundaries. Change the way information is managed and shared and revolutionize your file-sharing processes. 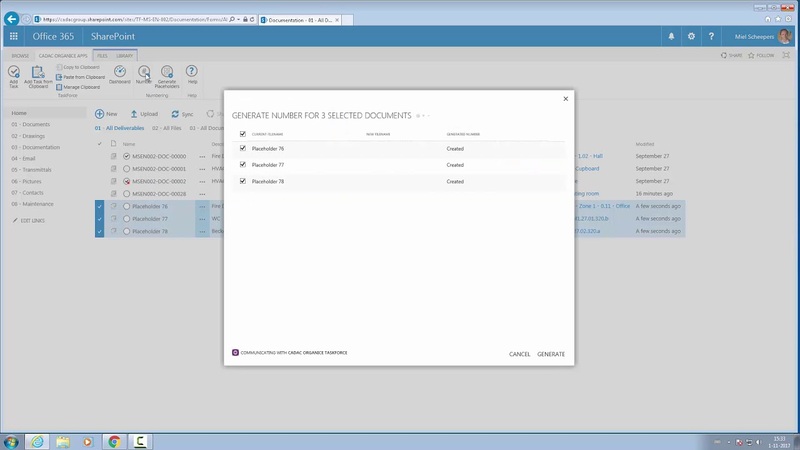 Manage your document tasks efficiently with one easy-to-use, SharePoint-based tool. 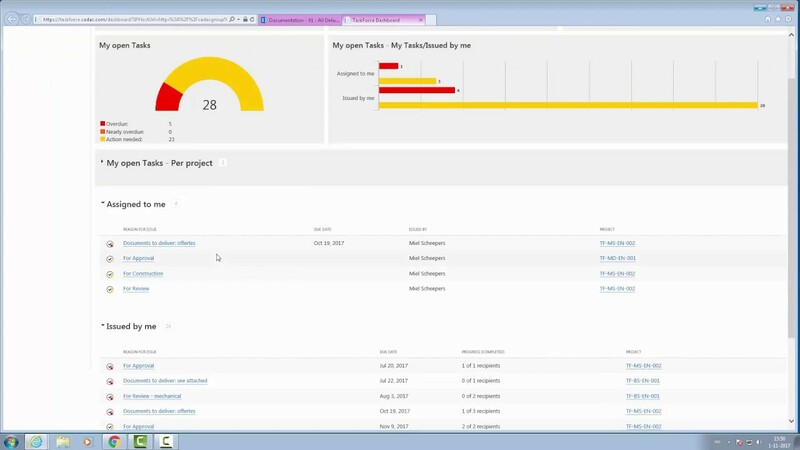 You can easily monitor issued and assigned tasks and project document status on live dashboards. Stop waiting. TaskForce helps you getting the required input exactly when you need it from all stakeholders, both internal and external. Add peace of mind that your document distribution is safe and secure, checked with a corporate-approved tool. Start collaborating on document tasks without the help of IT specialist. TaskForce is implemented, configured and trained in just a few hours. Maintain document version control to ensure all team members know which document to work on. The bigger your project, the more control you need. Organice TaskForce empowers you to manage and share project information and documents, both inside and outside corporate boundaries. Regardless of the variety of stakeholders, you can easily plan tasks for all your team members, clients, suppliers, and regulatory authorities. Organice TaskForce is a sanctioned tool because it's SharePoint-based that runs on SharePoint Online (Office 365). So you can stop relying on uncontrolled and unsanctioned methods of file-sharing and collaborating via email, Google Drive, Dropbox, and FTP servers. With 60% of enterprises using SharePoint as their strategic enterprise content management platform to keep their project files organised, Cadac launched the user-friendly SharePoint Add-in TaskForce. 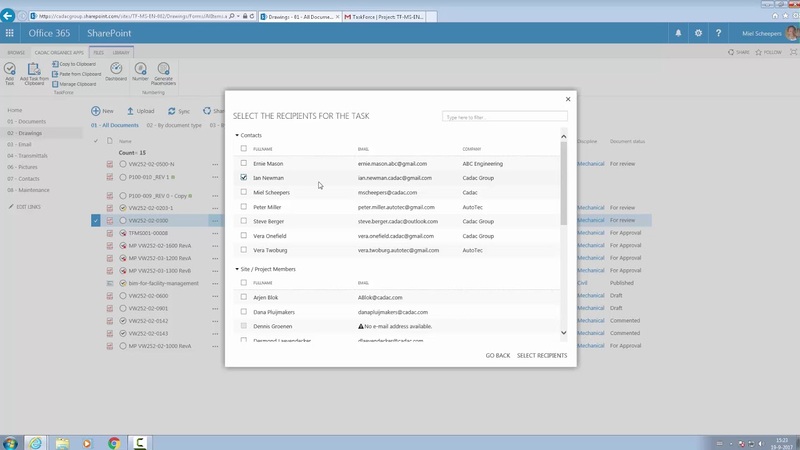 TaskForce is one easy-to-use, SharePoint-based tool to manage all your document tasks. It expands basic SharePoint functionality with effortlessly controlled task management and document sharing features. Oops! 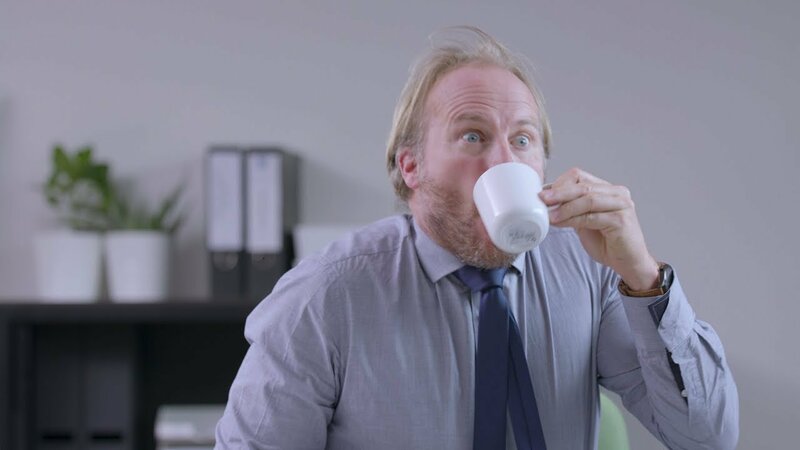 You just sent an email with the wrong attachment or with no attachment at all. 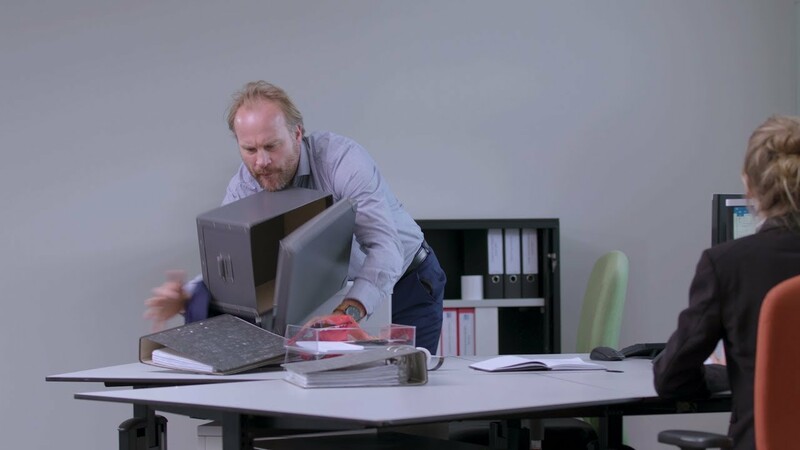 We’ve all done that - it’s common when using uncontrolled tools like Email, FTP, and Dropbox. And without transparency and version control, your stakeholders don’t know what’s been shared with whom, or why. The result is often organisational chaos that can lead to uncomfortable situations. To complete projects, you need the right input at the right time. One of the great features of TaskForce is an automated alert system that alerts all users to upcoming tasks and deadlines. This keeps your entire team on the same page to make sure you get exactly the required input and easily meet your deadlines. 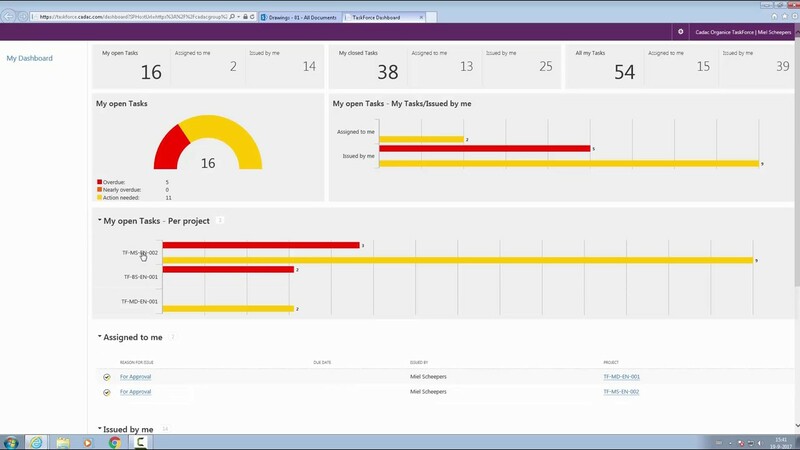 How do you currently track, monitor, and collaborate on documents to meet your project deadlines? 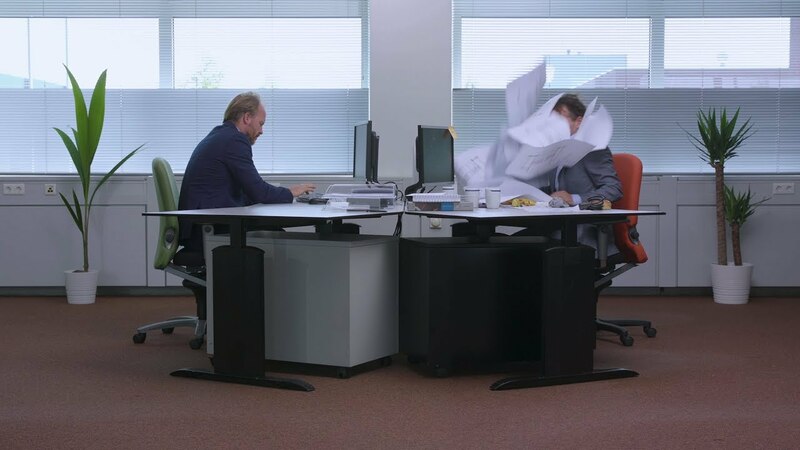 Recent studies show that more than 60% of organizations have no control over document collaboration. This issue becomes even more challenging if collaboration expands outside company borders. It has never been so easy to monitor tasks and project document status in real time, across all your projects! With the intuitive user interface and user-friendly dashboards of our SharePoint add-in, you can enable full transparency and control on all issued and assigned tasks. Organice TaskForce is licensed with a monthly subscription. All SharePoint users that actively use TaskForce require a license. External task recipients do not require a license. Meeting deadlines and reducing your document review time guarantees you can earn back your investment in no time. Are you collaborating on projects inside and outside your organisation? Our new SharePoint add-in is the solution. How does it work? Check our how-to videos and most important: join our free webinar to learn - in just 30 minutes - how to manage your document workflow hassle-free. Cadac Organice TaskForce allows you to create transmittals in SharePoint and ask internal and external parties to complete or reject a task. SharePoint transmittals are used to transfer the asset’s drawings, specifications, calculations and other information to internal departments, vendors, customers, or other stakeholder. In our free demo we will show you how you can use Cadac Organice TaskForce for transmittal management in SharePoint. Specified reason for document issue. Specified response required and deadline. 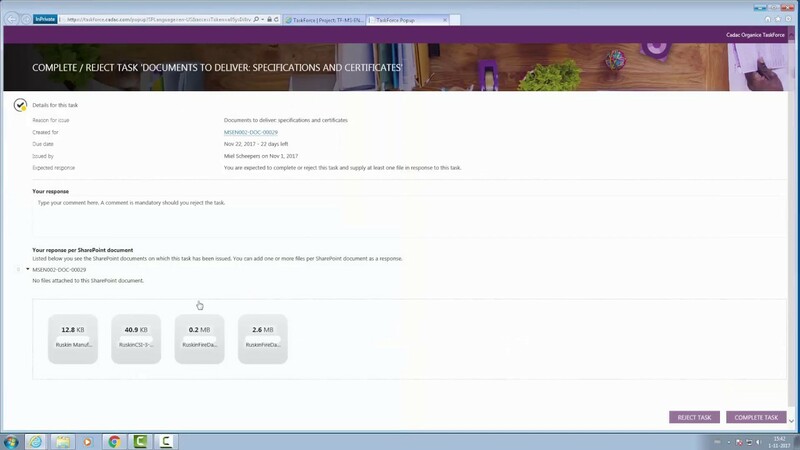 Notifications of new and completed tasks and due dates. 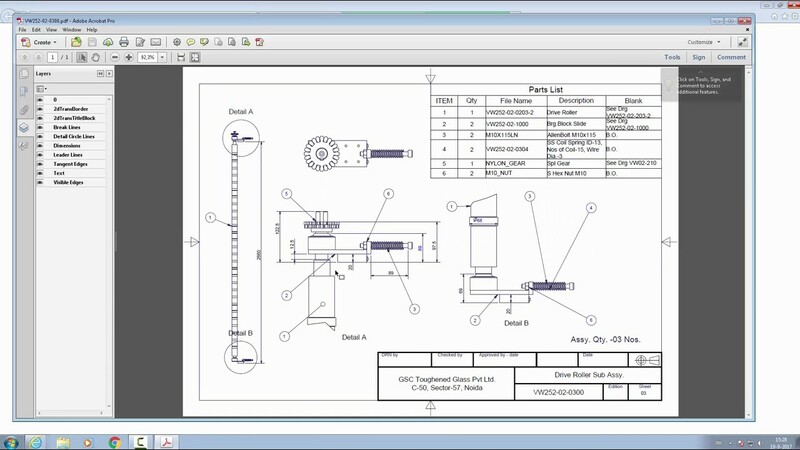 Create transmittals and ask internal and external parties to complete or reject a task. File sharing for external partners without allowing access to internal SharePoint environment. Dashboard providing a 360 degree view of all documents issued by and assigned to each user. Cadac TaskForce is the result of 30 years of experience implementing document management and control solutions and over 15 years developing SharePoint-based solutions for the engineering, manufacturing and construction world. The Cadac Organice TaskForce app is easy to use, easy to implement, and compatible with both SharePoint Online (Office 365) and SharePoint On-Premise. Check our how-to videos. You’re up and running in just a few minutes. Here at Cadac Group, we are proud of the development of the Cadac Organice Suite. This engineering collaboration solution makes collaborating on multidisciplinary projects easier than ever. We applied more than 30 years of experience to develop the Cadac Organice Suite, which is based on Microsoft SharePoint and Autodesk Vault and provides the ideal basis for managing and sharing digital engineering data and documents – on premise, in the cloud, or as a hybrid solution. Request a free demo and get started today! Check out more leading engineering collaborations solution based on Microsoft SharePoint. Visit our events or join our webinars. Where and when it suits you.